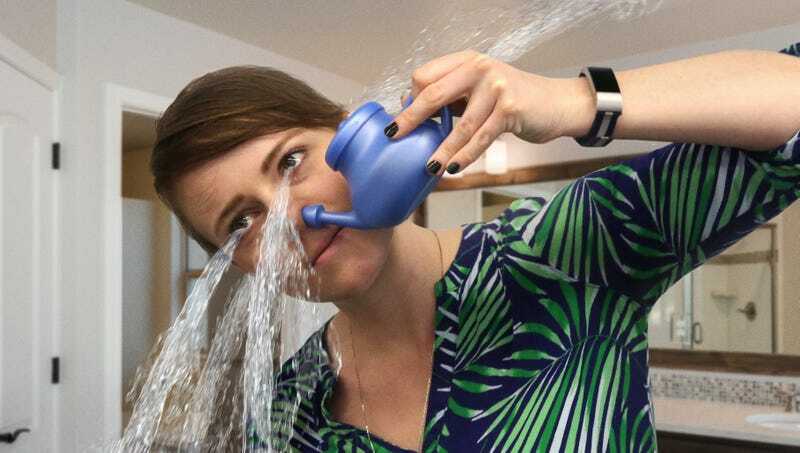 SANTA ROSA, CA—Urging anyone with flooding orifices to return the product immediately, neti pot manufacturer NasaFlo recalled 25,000 units Friday after a defect caused water to shoot out of customers’ eyes and ears. “If properly placed up against your nasal passage, our products should never, under any circumstances, force saline solution into your skull at such high speeds that it sprays from every hole in your face,” said NeilMed Pharmaceuticals spokesperson Marta Kober, explaining that rinsing was generally “a tad uncomfortable,” but Neti Pots should be returned immediately when water accumulates enough pressure to burst out of anywhere but the nostrils. “In addition, we’d like to apologize to anyone whose urinary tract or rectal cavities were cleared out along with their sinuses. As such, we are more than happy to fully refund 100 percent of Neti Pot users whose every opening was blasted with fluid right down to the pores.” Kober added that devices causing people to lose gallons of blood out of their noses should not be returned, as that was simply a result of sinus irrigation.